Well, it has been another crazy few weeks. After losing the buck to pasturella, i went through and gave everything a deep, deep clean, scrub, and samitization. It was unlikely that sanitization was the issue, as I clean everything weekly. But it was most likely the sudden change in temps, and the fact that they are out under the tarp. Be also came from a commercial rabbitry, which is where the issues came from. It also spread to Brimstone, my black meat doe, whom I ended up culling yesterday. It was a painful choice, but culling at first symptom is the only way to get rid of it. I am using VetRX rabbit on any rabbit that was exposed to him. Sorceress is also acting a bit weird. She is one of my best, as was Brimstone, so if she starts exhibiting, I will be very sad. We got over 6 inches of rain in one week, and everything is underwater. But lucky for me I decided to use six cattle panels, eight t posts, and some billboard vinyl from online to build a barn. I am also assembling cages and cage racks to get everything moved indoors. There is a lot of things that need to be done. 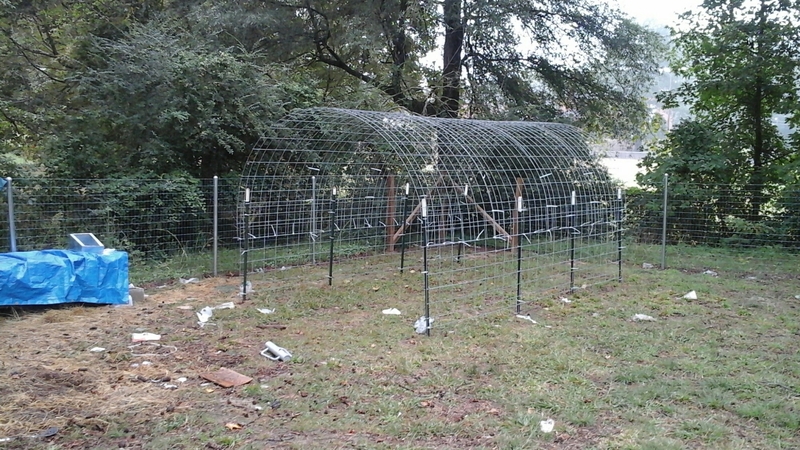 I used two 16 foot panels on their side, and zip tied the arched panels 8 inches down. 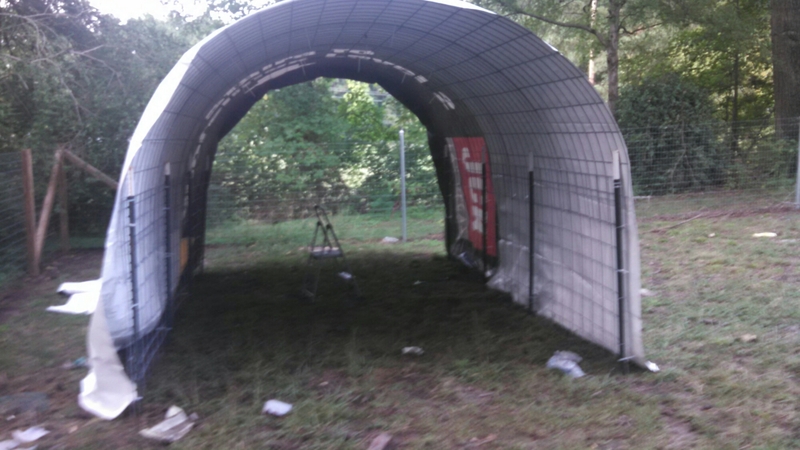 The result is a shelter that is 10 feet wide, 16 feet deep, and 9 feet high in the center. I haven’t attached the front or back walls yet, nor secured the ceiling on with anything but cinder blocks. Need to get some vinyl glue. So far, so good. It acts like a wind tunnel, which will be helpful in hot weather. It also reflects the sun.